There is a new celeb rivalry in town for those of you who like to read too deeply into interviews with actors. On Thursday's episode of Access Hollywood, Jared Leto said Jennifer Lawrence's fall at the Oscars might be part of an act. If you were watching the Oscars red carpet coverage, you may have seen Lawrence fall when she stepped out of her limo. This marked the second year in a row that Lawrence has fallen at the Oscars. Her first, and more memorable fall, happened on her way to the stage to accept her Best Actress win for Silver Linings Playbook. Recently, because Jennifer Lawrence is so "normal" and "quirky" — those aren't sarcastic quotes, those are just always the words used — some people have started suspecting that it is all at act. Could one girl really like eating cake AND Doritos?! Personally, I think Jennifer Lawrence is a fantastic actress and although I'm not a member of the Omg-J-Law-Is-EVERYTHING-Girl-Crush Club, I still don't think it's an act. If I was her, would I be more conscious of how in every interview I say something about being clumsy and maybe try to tone down the YA book heroine aspect? Yes, I would. That might say more about my hyper-awareness than it does about Lawrence, but I really think she's just being herself and herself just happens to give repetitive interviews sometimes. As for Leto, his words were, "You know, I'm starting to wonder if this is a bit of an act," but also joked about Ellen DeGeneres making fun of Lawrence while she was on stage. 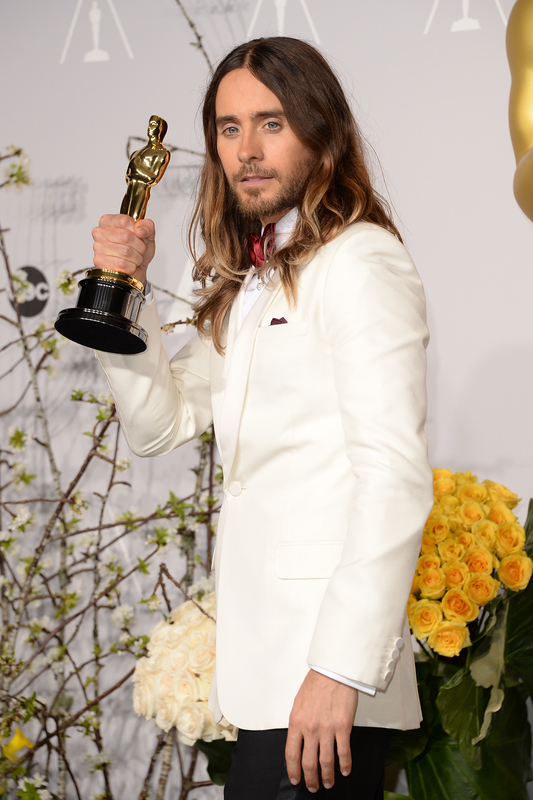 When Lawrence came out to present the award for Best Actor, Leto explained, "[Lawrence] said, 'What are you laughing at?' But what she didn't know was that Ellen was on the side…making, pantomiming [motions like], 'Don't fall, don't fall,' and my mom and my brother are all cracking up." I think Leto's "this is a bit of an act" comment was either meant as a joke entirely or he actually might sort of believe it, but was trying to present it as a joke. Either way, I don't think it was an attempt to "throw shade" at Lawrence, rather an attempt to poke fun at people's suspicions. If Lawrence ends up getting into a public social media fight with Jared Leto, color me surprised.